Significant features of two of India’s most celebrated Mughal gardens—Mehtab Bagh, and the Garden of the Tomb of I’timad-ud-Daulah at Agra—have been restored following four years of rigorous and complex research and conservation. 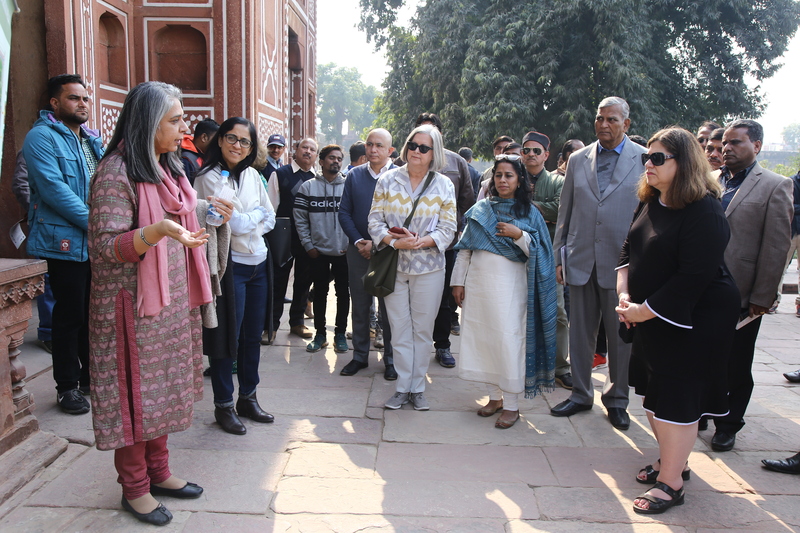 On Friday, World Monuments Fund and the Archaeological Survey of India, partners on the restoration, marked the completion during an inauguration ceremony at I’timad-ud-Daulah, alongside project supporters including American Express India. Only a few of the lush sixteenth and seventeenth-century gardens, built for Agra’s royalty and nobility along the Yamuna riverfront, today remain intact. Others have been significantly altered over time, and those that survive face challenges of urban development, pollution, traffic congestion, and lack of visitor amenities. 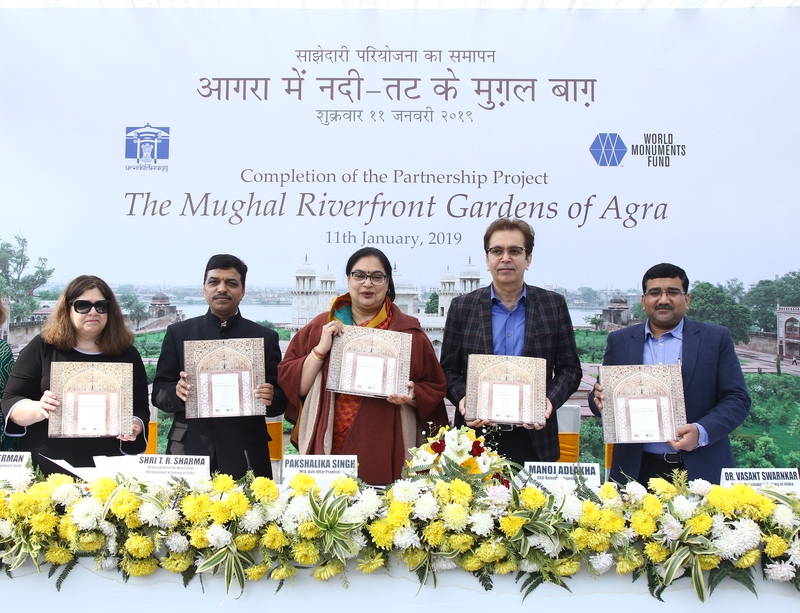 World Monuments Fund and the Archaeological Survey of India embarked on a project in 2014 to restore the authentic form of two of Agra’s most notable gardens, re-activate their water features, and enhance their visitor experience. As the project developed it became clear that an innovative approach to water management would be required. Over the centuries, the river that was once fed by the melting snows of the Himalayas became depleted and contaminated. An integrated water management system was designed to address the needs of the project as well as ensure that there would be no discharge or waste. Today, clean water is again flowing in the channels and into the gardens. The transformative restoration seeks to evoke the spirit of a Mughal Char Bagh as it relates to fragrance, fruit, shade, and running water. 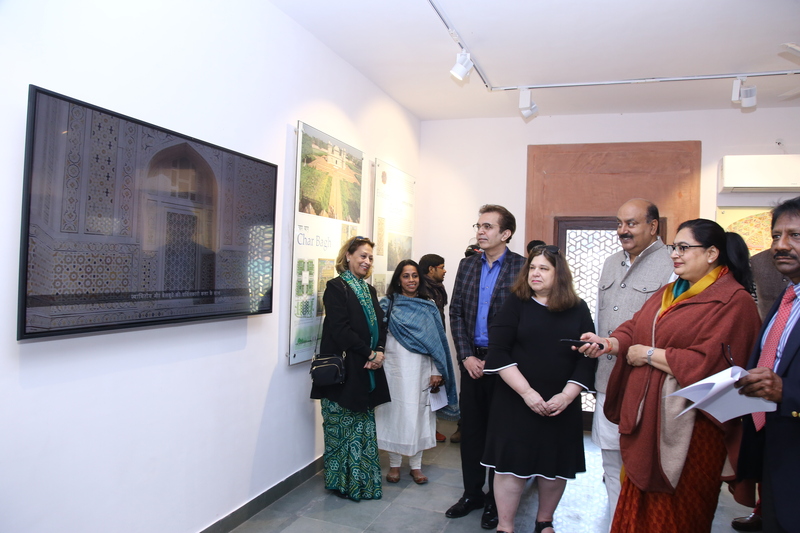 The four-year project concluded with the construction of a new visitor center at I’timad-ud-Daulah. 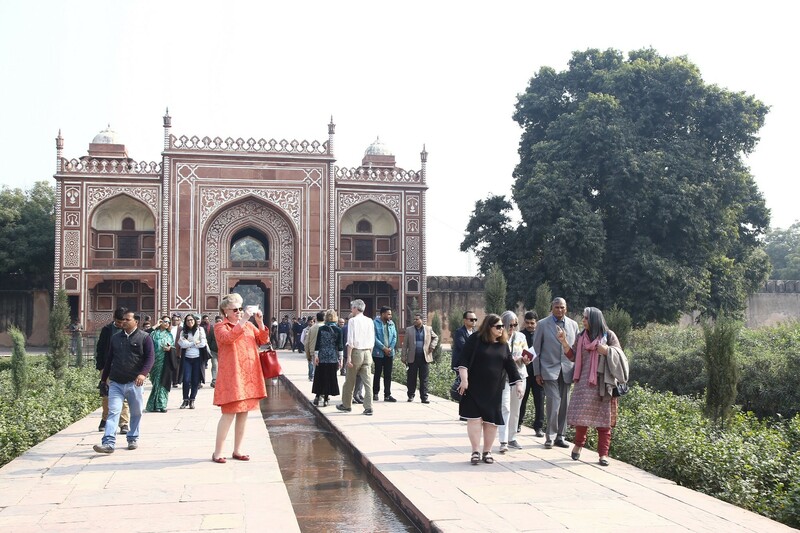 Raising awareness and visibility of the gardens was an important objective of the conservation, as they are often overshadowed by their more famous neighbor, the Taj Mahal. The enhanced visitor services will now offer local residents and tourists an opportunity to learn more about the history of the magnificent gardens through interactive exhibition kiosks, video, and more. The Garden of the Tomb of I'timad-ud-Daulah, prior to conservation. Garden of the Tomb of I'timad-ud-Daulah, post-conservation, February 2017. Garden of the Tomb of I’timad-ud-Daulah, post-conservation, March 2017. Garden of the Tomb of I'timad-ud-Daulah, post-conservation, September 2017. Garden of the Tomb of I’timad-ud-Daulah, post-conservation, August 2018. Image by Joginder Singh.